Makin’ it rain in the desert. Hard to believe? Note the per capita qualifier. In fairness, NY-based startups raised over $4.2 billion in venture funding in 2014 compared to Utah’s paltry $800 million. *sniff* But that’s not the whole story. Utah’s growing ability to capture venture funding has enjoyed some pretty good press. In straight-up dollars, Utah captured 1.66% of all venture capital investment dollars in the U.S. last year and 1% of all investment transactions. It’s been a good season for Utah. Accolades for companies in the beehive state have been voluminous. One Inc. article even taunted Move Over Silicon Valley: Utah has arrived. Now if you’re in Silicon Valley, that seems a bit silly. SV is the clear leader and trendsetter, with a dominant 56.16% of U.S. venture capital. The thing that makes Utah interesting is that you sort of expect California to come in big. Silicon Valley is practically synonymous with Venture Capital. Utah’s more of a dark horse. Truthfully, I’d say there’s more symbiosis than competition. Utah also benefits from its proximity, close enough to SJC to fly out and back the same day. Utah is likely drafting Sandhill Road, catching some of the slush that washes over the gunwales from the Bay Area. Whatever the reason, Utah companies are getting it done. Local firms and their ability to attract both number and dollar volume of funding deals has been outstanding in 2014. With so much talk and froth, I was interested in seeing how Utah stacked up per capita. Of course Utah lags behind any of the biggies if we are just looking at the totals. Why would that matter? Well, I assumed that the amount of funding captured by a given population would represent a certain funding fitness that summed up all the elements at work in producing funding-worthy companies and entrepreneurs. You know, out of n population, we generated x number of fundable deals. There are other measures, for instance the Tech Startup Density reported by NerdWallet (Salt Lake and Provo made the top 20 in the U.S.). But that doesn’t tell me much of what I want to know. If I’m an entrepreneur, where do I go to marinade in the right ecosystem to build and fund a successful company? And, what if I don’t want to live in the Bay Area? 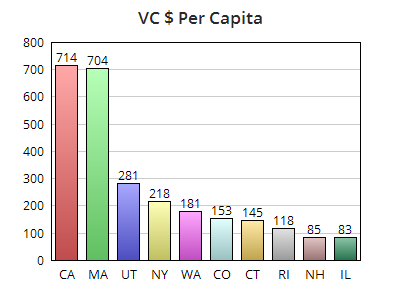 So I compared state census data and a report from the NVCA and PwC, and came up with the following top 10 states based on venture capital dollars raised per capita. Utah was also almost twice the national average of $154, which skews high because of the monolithic golden state (take CA out of the mix and Utah is over 4x higher than the remaining U.S. average per capita). I’ll posit that the per capita venture capital garnered in Utah and other states, is predictive. It’s a canary in the proverbial coal mine, the tip, the surge within the peloton that forms a leading indicator of awesomeness to come. So, if you’re an entrepreneur with a great idea and an indomitable spirit… and you happen to live in Alaska or Montana (two states that garnered a combined total of zero funded deals in 2014), pack up your mountain bike and your pitch deck and get to Utah!